Those who have studied the life’s work of Dr. Royal Lee cannot help but become infected with his passion to help people live better and healthier—an endeavor that integrated science, agriculture, physiology, engineering, invention, politics, education, business, biochemical manufacturing, and philosophy. Dr. Lee’s embarrassment of talents fueled an understanding of the “big picture” that would have been praised as holistic had only the word — and comprehension of it — existed in his day. To learn more about Dr. Lee and his incredible legacy, expand any of the sections below. Born on April 7, 1895, Dr. Lee forever approached humanity’s problems in a practical way, securing over seventy U.S. patents for electrical and mechanical devices throughout his lifetime. The badges of his company Lee Engineering could be found in almost any device of advanced technology, and there was probably no field in industry—from automotive to military to agriculture to the U.S. space program—that did not rely on one of his inventions. But despite the wealth and notoriety his engineering marvels brought, Dr. Lee’s greatest love was always the subject of nutrition. By age twelve, in 1907, he’d compiled a comprehensive notebook of biochemical terms, and by sixteen he was buying up books on physiology and biochemistry and “keeping a notebook of pertinent data,” as he told it. As Dr. Lee studied the works of the early endocrinologists, he also read everything he could on animal-diet research and other studies in a field that had not yet even been named nutrition. Through it all he came to see that the key to the health of the endocrine system, that master control of the human body, is sufficient intake of vitamins, but not in the sense this word has come to mean today—single, lifeless chemicals produced in a laboratory. No, Dr. Lee’s mind, so gifted at comprehending how machines and other mechanisms function, knew what most nutritionists and doctors still fail to recognize to this day: vitamins are not single chemicals, but rather they are complex groups of interdependent compounds that can be made only by living organisms. A true vitamin, Dr. Lee insisted, is a biological mechanism that can be obtained only from whole, unprocessed foods. This principle—that vitamins are the result of life and their functions are far too complex to be reproduced by human beings—would underlie Dr. Lee’s entire life’s work. In 1916, at the age of 21, Dr. Lee began formulating a concentrate that would optimize endocrine health by delivering all the known vitamins and minerals in their natural, whole, bioactive state. It would be a few years before he invented the technology to preserve the delicate nutrient complexes in the foods of his formula, but by 1929 Lee would be producing the world’s first raw, whole-food supplement—over half a century before “raw” and “whole food” even entered the public discussion about nutrition. After serving overseas in the U.S. Army during World War I, Dr. Lee graduated from Marquette University Dental College in Milwaukee in 1924. In an event that would presage things to come, he shocked his professors with a graduation speech presenting a radical new theory on the formation of cavities, titled “The Systemic Cause of Dental Caries.” Basing his case on documented research, Dr. Lee pointed out that the true cause of tooth decay is dysfunction in the internal state of the body as a result of malnutrition and consequent endocrine disorder. It was a bombshell. (And, sadly, it still is, even as open-minded dentists today regularly reverse tooth decay using Dr. Lee’s ideas). When his professors later called on him to defend his thesis, Dr. Lee proved his points with the very information contained in the dental textbooks provided by the college! The professors were incredulous, but by the end of the next decade, Dr. Lee would have his final proof. In the 1930s Lee’s friend and dental colleague Dr. Weston A. Price embarked on an epic, worldwide expedition to photograph and document the effects of processed foods on the dental and physical health of indigenous people throughout the globe. Dr. Price’s report, the landmark text Nutrition and Physical Degeneration, showed unequivocally that poor nutrition is behind not just tooth decay but other modern diseases such as heart disease, diabetes, stroke, cancer, and so on—all of which “just so happened” to appear in the human race at the same time as processed foods. In researching his thesis at Marquette, Dr. Lee became convinced that malnutrition—at the hand of processed foods, deficient in true, whole vitamins—was possibly modern humanity’s greatest problem. Educating doctors and the public about this dilemma and using his genius to create practical solutions to it would become his life’s work and crusade. By the height of the Great Depression, Dr. Lee’s engineering royalties had earned him enormous wealth. 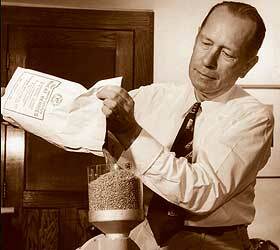 Being a man of simple tastes, he poured his profits from Lee Engineering into his true love, nutrition. To help offset the national malnutrition caused by “devitalized” processed foods, he resolved to produce the food concentrate he’d begun formulating in his early twenties. He knew the key to the concentrate lay in preserving the vitamin complexes as they exist naturally in whole foods. So, putting his engineering genius to work, he designed and built devices to extract and concentrate food without heating it or mechanically refining it. In 1929 his efforts reached fruition when he finally perfected the concentrate he’d conceived years earlier to create Catalyn, the first raw, food-based supplement ever to be produced. Catalyn was made by concentrating foods that Dr. Lee knew from exhaustive research to have the highest amounts of the known essential vitamins and minerals. It produced remarkable results in the people who tried it, particularly those who suffered heart disease, and many patients enjoyed a complete reversal of health problems that had been declared beyond help by medical doctors. Word of Catalyn grew. To meet the demand for his increasingly famous food concentrate, Dr. Lee established the Vitamins Product Company (from which he would receive a nominal salary of $1 per year throughout his lifetime). Vitamin Products Company would later become Standard Process, Inc., which continues to produce and distribute Dr. Lee’s formulations today. In the early 1930s, Dr. Lee purchased some large organic farms in the fertile glacier-grazed lands of Wisconsin, where he’d grown up on a farm. In addition to growing the organic foods used in Catalyn and other formulations he would develop, he also built a laboratory there as well as custom designed equipment to concentrate and preserve the foods without damaging their delicate nutrient complexes. Basing his work, as always, on extensive research (which included having foreign science journals translated into English at his own expense), Dr. Lee designed and produced hundreds of nutritional formulas in the years to come, each created to address a different cause of nutritional deficiency. Working closely with health care practitioners, Dr. Lee documented thousands of case studies affirming the seemingly miraculous results of his products. Why did Dr. Lee’s formulas work so well? The key, he always maintained, lay in the idea of what a vitamin really is. From his studies of physics, he knew that the basic axiom of holism—the whole is greater than the sum of its parts—is absolutely critical to understanding how a vitamin interacts with the body. Vitamins as they appear in food are never single, isolated chemicals. Instead they are groups of biochemically interdependent substances that all work together—each cofactor performing a specific function—to deliver a collective nutritive effect to the body. This understanding was in stark contrast to that of the reductionist-minded chemists and biochemists of the time, who believed that nutritional complexes could be reduced to, or at least approximated by, their “most important” parts. To these critics, Dr. Lee would often ask, “Which part of a watch keeps time?” No single part, of course. The various pieces work together to perform a function that transcends that of any of the individual parts. Moreover, only the complete set of parts will perform the function; remove just one of these parts, and the mechanism fails. Vitamins are biological mechanisms, Dr. Lee explained. Like a watch, they consist of a multitude of parts—some we may never identify—that act together to deliver to the body a transcendent “vitamin effect.” The chemist (or modern supplement maker) who isolates a few parts of a vitamin complex and expects these parts to deliver the effect of the entire mechanism might as well slap a few pieces of brass on his or her wrist and ask them to tell time. Moreover, Dr. Lee said, vitamin complexes are so biochemically complicated that only a living cell can create them. Just as a computer programmer will never recreate a human brain, chemists will never reproduce a true vitamin in a lab. Isolated vitamin parts, whether natural or synthetic, are the antithesis of the holistic principle of biology. Every day new research confirms Dr. Lee’s assertion that a lack of vitamins and minerals from whole foods leads to disease. While this fact may seem obvious to us now, in Dr. Lee’s time making such a claim was in direct opposition to the prevailing opinion of both the medical field and the U.S. Food and Drug Administration (FDA), which declared it “wholly unscientific” that a well fed body resists disease better than a less well fed body. Dr. Lee’s views put him add odds not just with organized medicine and the FDA but also with the food manufacturing industry. Lee’s work threatened the security of these commercial interests, and at their behest government agencies were assigned to discredit him. Throughout his life, Dr. Lee would endure perpetual legal prosecution and shameless character assassination at the hands of these agencies. Dr. Lee was a principled man. He did not believe in backing away from the truth, regardless of the cost. With Americans increasingly consuming processed foods so devoid of the nutritive complexes critical to health, he carried on his work in spite of the lawsuits brought against him. Sadly, within five years, at age 72, Dr. Lee would be dead from a stress-induced stroke, his work and reputation tragically buried with him, left to a later generation to fairly evaluate. His wife and partner, Evelyn, survived until 105 years old, carrying on his mission to show the American people the importance of whole food nutrition through the Lee Foundation and the other companies he founded.